White paper on crime 2001 Part 2/Chap.4/Sec.2/3. Fig. II-9 shows the percent distribution of offenders newly imprisoned in 2000 by gender and age group. Of offenders newly imprisoned in 2000, 2, 130 were 60 years of age or older, accounting for 7.7% (7.6% in the previous year) of all new inmates. Of offenses committed by those newly imprisoned in 2000, the following five offenses had high percentages for male inmates:larceny (26.9%);Stimulant Drug Control Law violation (25.7%);Fraud (6.7%);Road Traffic Law violation (6.5%);andbodily injury (5.8%). The following five offenses had high percentage for female inmates:Stimulant Drug Control Law violation (47.4%);larceny (21.0%):Fraud (9.4%);homicide (4.4%);andarson (3.3%) (see Appendix II-7 ). By type of sentence given to those newly imprisoned in 2000, 99.2% (27,274 inmates) were sentenced to imprisonment with labor, followed by imprisonment without labor (0.6%, 173 inmates), penal detention (0.2%, 48 inmates) and death penalty (executed) (0.01%, 3 inmates). Fig. 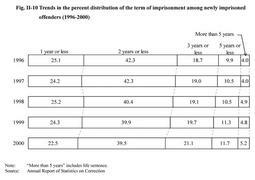 II-10 shows the percent distribution of the term of imprisonment for offenders who were sentenced to imprisonment with labor and newly imprisoned during the period from 1996 to 2000,which indicates that the percentage of inmates sentenced to imprisonment for more than two years has been gradually increasing. Fig. II-11 shows a breakdown of the 13,371 first-time convicts (persons imprisoned to penal institutions for the first time under final judgments) who were newly imprisoned in 2000, according to their histories of suspended sentences and protective measures. Of all offenders newly imprisoned in 2000, reimprisoned convicts (persons who have previously been imprisoned to penal institutions once or more) accounted for 52.5% for males and 31.5% for females. By type of offense, repeat convicts most frequently committed Stimulant Drug Control Law violations for both genders (30.8% for males and 56.6% for females). The number of new inmates who had previously been imprisoned to penal institutions four times or more was 5,762, accounting for 21.0% of the total, and such new inmates accounted for 46.5% of those imprisoned for Physical Violence Law violations and 31.8% of those imprisoned for breaking and entering (see Appendix II-8 and II-9 ).